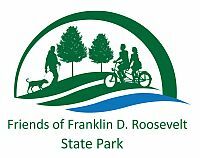 Join the Friends of FDR on a two-mile round trip hike to enjoy the progress made in connecting the park to Baldwin Road. Previous First Day Hikes have taken visitors to the inlet stream. Now it is possible to walk to the outlet stream thanks to a bridge over the inlet stream and boardwalks over wet areas. This hike is a great introduction to a part of the park that has been seldom visited. Enjoy a scenic area by the bridge and views out over Crom Pond. Learn about a bridge building project next spring and how you can join the fun. Given the number of people who have come on previous First Day Hikes and the narrow trails for a portion of the route, please no dogs. If two miles seems too far, the walk to the bridge and back is 0.8 mile. Meet at the north end of the swimming pool parking near the bench by the white trail at 10:30. Dress in layers with hat and gloves. Leader will show up regardless of weather.